This is what I get asked about the most when talking about my business partnership – this lengthy, complex agreement that took us the better part of a year to put together and is one of the big reasons our partnership has remained strong (and fun) for over 5 years while 70% of business partnerships fall apart around us. Note: if you are not interested in business partnership agreements, stop reading now. Our OA is about as wordy as the Treaty of Versailles (although arguably much more successful), and the only interesting photos in these OA posts will be the banner pics. Nothing that I am sharing here is legal advice, or evan advice for your particular situation. I’m just sharing how we did our OA. If it can be helpful to you as you contemplate a business partnership, that’s awesome! Still with us? Great! If you have not already, make sure that these questions for the junior partner and questions for the senior partner have been discussed and answered to everyone’s satisfaction. Then let’s get right down to what’s in our OA. This is the first page. This should tell you two things: 1. This is going to be a non-stop parade of tedious details and legal jargon, and 2. You absolutely MUST have a lawyer familiar with the business laws in your area be part of this process. Below is the content of the next dozen or so pages of our OA. They cover the basics of the partnership formation, definitions (super important to agree on), and an overview of the money (capital contributions) that went into the partnership resulting in ownership by the partners. 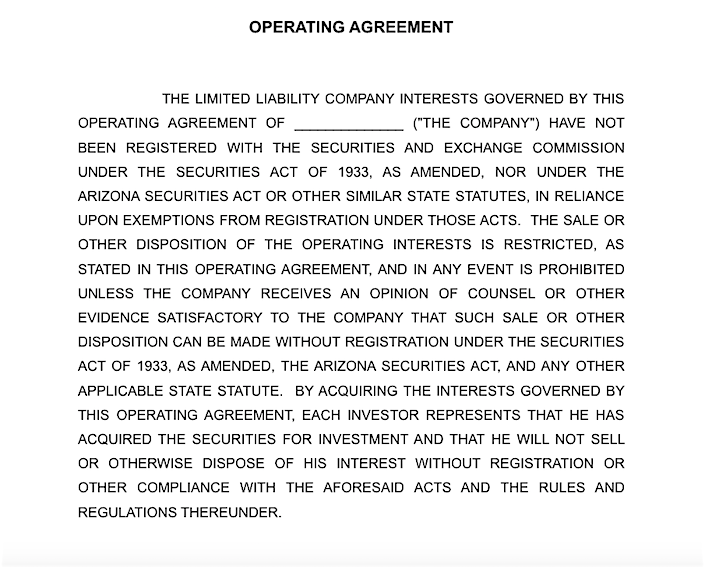 THIS OPERATING AGREEMENT (“Agreement”) is made and entered into as of (date) between (partner name(s)). ARTICLE I: FORMATION, NAME, PURPOSES, DEFINITIONS. 1.1 Formation. Pursuant to the (State) Limited Liability Company Act (the “Act”), the parties have formed a (State) limited liability company effective upon the filing of the Articles of Organization of this Company with the (State) Corporation Commission. The parties shall immediately, and from time to time hereafter, as may be required by law, execute all amendments of the Articles of Organization and do all filing, recording, and other acts as may be appropriate to comply with the operation of the Company under the Act. 1.2 Intent. It is the intent of the Members that the Company shall always be operated in a manner consistent with its treatment as a “partnership” for federal and state income tax purposes. It also is the intent of the Members that the Company not be operated or treated as a “partnership” for purposes of the Federal Bankruptcy Code. No Member shall take any action inconsistent with the express intent of the parties hereto. 1.4 Place of Business, Registered Office. The principal place of business and registered office of the Company shall be (business address) or such other place as the Members shall determine in their sole discretion. 1.5 Purpose. This Company has been formed to engage in the business of orthodontics and to do any and all other lawful acts concerning any lawful business other than banking or insurance for which a limited liability company may be organized and may engage in any activities that are directly related to the accomplishment of such purpose. 1.6 Term. This Company shall commence upon the filing of its Articles of Organization and shall continue until such time as it shall be terminated under the provisions of Article X hereof. 1.7 Members. The name of each of the Members of this Company are listed in Article 2.1 and incorporated herein by this reference. 1.8 Agent for Service of Process. The name and business address of the agent for service of process for the Company is (name and address – we just picked one of us to be “agent”) or such other person as the Members shall appoint from time to time. A. “Act” shall mean the (State) Limited Liability Company Act. B. “Additional Member” shall mean any person who is admitted to the Company as an Additional Member pursuant to this Operating Agreement. C. “Agreement” shall mean this written Operating Agreement. No other document or oral agreement among the Members shall be treated as part of or superseding this Agreement unless it is reduced to writing and it has been signed by all of the Members. D. “Bankrupt Member” shall mean a Member who has filed a voluntary petition for liquidation or reorganization under any Chapter of the United States Bankruptcy Code, or any successor statute; or against whom there has been filed an involuntary petition under any Chapter of the United States Bankruptcy Code, or any successor statute, which petition is not dismissed within ninety (90) days of the date of filing; or who has initiated, either in an original Proceeding or by way of answer in any state insolvency or receivership proceeding, an action for liquidation arrangement, composition, readjustment, dissolution, or similar relief. E1. “Capital Account” shall mean, with respect to each Member, the Capital Account maintained for such Member in accordance with the following provisions: 1. To each Member’s Capital Account there shall be credited such Member’s Capital Contributions, such Member’s distributive share of Net Income and of any items in the nature of income or gain which are specially allocated pursuant to this Operating Agreement, and the amount of any Company liabilities assumed by such Member or which are secured by any property distributed to such Member. E2. To each Member’s Capital Account there shall be debited the amount of cash and the Gross Asset Value of any property distributed to such Member pursuant to any provisions of this Agreement, such Member’s distributive share of Net Loss and of any items in the nature of expenses or losses which are specially allocated pursuant to this Operating Agreement, and the amount of any liabilities of such Member assumed by the Company or which are secured by any property contributed by such Member to the Company. E3. In the event all or a portion of an interest in the Company is transferred in accordance with the terms of this Agreement, the transferee shall succeed to the Capital Account of the transferor to the extent it related to the transferred interest. The foregoing provisions and the other provisions of this Agreement relating to the maintenance of Capital Accounts are intended to comply with Regulations Section 1.704-1(b) relating to the maintenance of capital accounts and shall be interpreted and applied in a manner consistent with such Regulations. In the event the Manager shall determine that it is prudent to modify the manner in which the Capital Accounts or any debits or credits thereto are computed in order to comply with such Regulations, the Manager may make such modification, provided that it is not likely to have a material affect on the amounts distributable to any Member pursuant to this Operating Agreement upon the dissolution of the Company. F. “Affiliate(s)” of any person shall mean: (a) any person directly or indirectly owning, controlling, or holding the power to vote ten percent (10%) or more of the outstanding voting securities of such other person; (b) any person, ten percent (10%) or more of whose outstanding voting securities are directly or indirectly owned, controlled, or held with power to vote by such other person; (c) any person directly or indirectly controlling, controlled by, or under common control with such other person; (d) any officer, director, or partner of such other person; and (e) if such other person is an officer, director, or partner, any company for which such person acts in any such capacity. G. “Capital Contribution” shall mean any contribution to the capital of the Company in cash, property, or services by a Member whenever made. “Initial Capital Contribution” shall mean the initial contributions to the capital of this Company, as set forth in Article 2.1. “Additional Capital Contributions” shall mean the contributions made pursuant to Article 2.2 of this Agreement. H. “Unreturned Additional Capital Contribution” shall mean, with respect to any Member, that Member’s Additional Capital Contribution reduced by the distributions paid to that Member pursuant to Article 6.1 (B) hereof. I. “Code” shall mean the Internal Revenue Code of 1986, as amended from time to time. J. “Contracts Receivable,” for purposes of Articles 8.2(f), 8.2(g), 8.3, 8.5(f), and 8.6 of this Agreement, shall mean the total contracts balance less past due accounts receivable sixty (60) days or more past due and less credit balances. The Contracts Receivable number used for purposes of Articles 8.2(f), 8.2(g), 8.3, 8.5(f), and 8.6 of this Agreement will be the average of the contracts receivable that existed on the last day of each month for the six (6) month period immediately preceding the closing of the sale provided for in the particular Article in question. The average will be calculated by totaling the six (6) monthly amounts and dividing by 6. K. “Company” shall refer to (business name). L. “Day” or “Days” shall refer to calendar days. In computing any period of time prescribed by this Agreement, the day of the act, event or default from which the designated period of time begins to run shall not be included. The last day of the period so computed shall be included, unless it is a Saturday, a Sunday or a legal holiday, in which event the period runs until the end of the next day, which is not a Saturday, a Sunday or a legal holiday. M. “Cash Available for Distribution” means all cash, revenues, and funds received from Company operations. N. “Event of Dissociation” shall mean an event, as set forth in Article 8.9, which shall cause a Member to cease to be a Member. O. “Fiscal Year” means the Company’s fiscal year which shall be the calendar year. P. “Interest Holder” shall mean any person’s share of the Profits and Losses of, and the right to receive distributions from, the Company. Q. “Majority-In-Interest” of the Company (or of a group of Members) shall mean a vote by Members holding more than fifty percent (50%) of the then outstanding Ownership Interests of the Company (or that group of Members). R. “Manager” shall mean (name – we just picked one of us) or any other person that becomes a Manager pursuant to this Agreement. S1. “Member” shall mean each of the parties who qualifies for Membership as set forth below and who executes a counterpart of this Operating Agreement and each of the parties who may hereafter become Additional Members. S2. Member Qualifications. To qualify for Membership in the Company, a party (or its principal) must (1) maintain in good standing all necessary licenses to practice dentistry in the State of Arizona, (2) comply fully with all of the provisions of the canons of professional ethics as adopted by the American Dental Association, American Association of Orthodontics, and the Arizona Dental Association, (3) practice orthodontics in full compliance with all statutes, rules and regulations, and (4) maintain professional liability insurance in such amounts and upon such terms as determined by the consent of all Members. If a Member (or a Member’s principal) fails to maintain any of the above qualifications at any time and for any reason, that Member shall automatically be removed as a Member with no further action or notice required, and such removal shall be deemed a default under the parties’ Promissory Note. Management companies, orthodontic groups, orthodontic franchises, and similar enterprises and entities are not qualified for Membership in the Company. T. “Ownership” or “Percentage Interest” shall mean, as to a Member, the percentage set forth after that Member’s name reflected in Article 2.1 of this Agreement, as amended from time to time, and, as to an Interest Holder who is not a Member, the Percentage Interest of the Member whose Interest has been acquired by such Interest Holder, to the extent the Interest Holder has succeeded to that Member’s Interest. U. “Person” shall mean any individual and any legal entity, and their respective heirs, executors, administrators, legal representatives, successors, and assigns. V. “Treasury Regulations” shall mean the Regulations issued by the Treasury under the Code. W. “Withdrawal Event” shall mean those events and circumstances listed in A.R.S. § 29-733. X. “Prime Rate” shall mean the prime interest rate listed in the Wall Street Journal or its successor. Y. “Regulatory Allocations” shall have the meaning set forth herein at Article 6.5. Z. “Securities Act” shall mean the Securities Act of 1933, as amended. AA. “Tax Matters Partner” shall be the Manager unless the Members delegate another person to serve in this capacity. The Tax Matters Partner shall have all of the powers and responsibilities as provided in Code §6221, et seq. BB. “Transfer” shall mean any sale, assignment, hypothecation, pledge, encumbrance, or any other disposition thereof to any person or any grant to any person of any interest in the Company therein or with respect thereto. CC. “Transferee” shall mean a person, trust, corporation, or other organization or entity of any kind to which part or all of a Member’s Interest in the Company is transferred from the Member. DD1. The initial Gross Asset Value of any asset contributed by a Member to the Company shall be the gross fair market value of such asset, as determined by the contributing Member and the Company. DD2. The Gross Asset Value of all Company assets shall be adjusted to equal their respective gross fair market values, as determined by the Manager, as of the following times: (a) the acquisition of an additional interest in the Company by any new or existing Member in exchange for more than a de minimis Capital Contribution; (b) the distribution by the Company to a Member of more than a de minimis amount of property as consideration for an interest in the Company; and (c) the liquidation of the Company within the meaning of Regulations Section 1.704-1(b)(2)(ii)(g); provided that the adjustments in clauses (1) and (2) above shall be made only if the Manager reasonably determines that an adjustment is necessary or appropriate to reflect the relative economic interests of the Members in the Company. DD3. The Gross Asset Value of any Company asset distributed to any Member shall be the gross fair market value of such asset on the date of distribution. EE1. Income of the Company that is exempt from federal income tax and not otherwise taken into account in computing Net Income or Net Loss pursuant to this definition shall be added to such taxable income or loss. EE2. Any expenditures of the Company described in Code Section 705(a)(2)(B) or treated as Code Section 705(a)(2)(B) expenditures pursuant to Regulations Section 1.704-1(b)(2)(iv)(i) and not otherwise taken into account in computing Net Income or Net Loss pursuant to this definition shall be subtracted from such taxable income or loss. EE3. In the event the Gross Asset Value of any Company asset is adjusted pursuant to this Operating Agreement, the amount of such adjustment shall be taken into account as gain or loss from the disposition of such asset for purposes of computing Net Income or Net Loss. EE4. Gain or loss resulting from any disposition of property with respect to which gain or loss is recognized for federal income tax purposes shall be computed by reference to the Gross Asset Value of the property disposed of, notwithstanding that the adjusted tax basis of such property differs from its Gross Asset Value. EE5. Notwithstanding any other provision of this definition, any items which are specifically allocated pursuant to this Operating Agreement shall not be taken into account in computing Net Income or Net Loss. FF. “Personal Representative” of a Member shall include his or her trustee, executor, personal representative, administrator, guardian, or other legally appointed conservator of his or her estate. GG. “Full Market Value” of a Member’s share is defined as percentage of ownership interest multiplied by ((contracts receivable) divided by 0.7). 2.2 Additional Capital Contributions. The Members shall make Additional Capital Contributions to the Company at such time or times and upon such conditions as Members holding one-hundred percent (100%) of the Ownership Interests of the Company may determine in writing. Unless otherwise specified, all contributions shall be payable in cash no later than thirty (30) days after the written determination. The foregoing notwithstanding, no Additional Capital Contribution shall be required of any Member to the extent such Additional Capital Contributions will cause the Member’s Unreturned Additional Capital Contribution to exceed twenty-five percent (25%) of the Member’s Initial Capital Contribution. Except as provided otherwise above, no Member shall have any obligation to the Company or the other Members to make any loan or any Additional Capital Contribution to the Company, nor shall any Member be permitted to make a voluntary contribution to the Company without the consent of Members holding one hundred percent (100%) of the Ownership Interests of the Company. 2.3 Failure to Make Additional Capital Contribution. If any Member fails to make his or her Additional Capital Contribution when due: (i) the non-paying Member shall forfeit his or her right to participate in the Company, including but not limited to those voting rights associated with his or her Interest; (ii) the Manager shall give written notice to the other Members, who shall have the option for a period of thirty (30) days to make some or all of the non-contributing Member’s Additional Capital Contribution in proportion to their relative Percentage Interest or in such other proportion as they may all agree; (iii) the Percentage Interests of the Members shall be adjusted to equal the percentage which each Member’s total Capital Contributions bear to the total Capital Contributions of all the Members; and (iv) the Manager shall give written notice to all of the Members of the adjusted Percentage Interests. This remedy is in addition to any other remedies allowed by law or this Agreement.